A new upscale pizza option has arrived in the Old Fourth Ward. Ammazza is Italian slang for expressing astonishment or admiration, and they offer a selection of Neopolitan-style pizzas in a hip Edgewood Ave space. 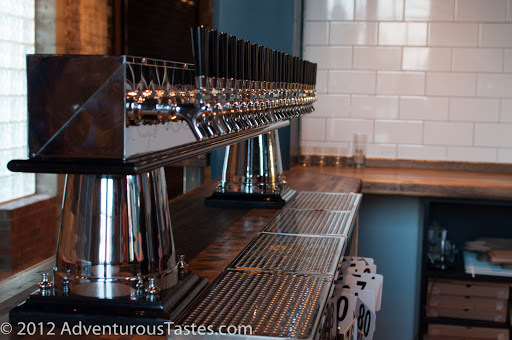 Upon entering, you only see a bar/counter. Choose among a small antipasto menu, 13 different pizzas (including 2 fried options), and an an impressive beer and wine menu. A kids menu even includes something called a glitter pizza, which is exactly what it sounds like - a pizza topped with edible glitter. No kiddos with us that night, so I didn't get to sample, but the little girl in me loves the sound of it. These days, no high end pizza joint is complete without fancy and authentic Italian-style pizza ovens. 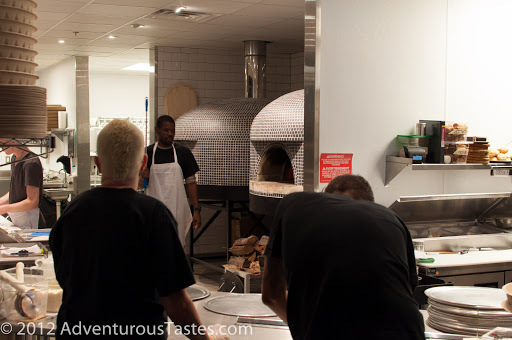 The co-owner said that Ammazza's ovens are American-built ovens that improve a bit on the ubiquitous Italian Acunta ovens populating many of the high-end pizza parlors that have popped up in Atlanta. Ammazza's six-thousand pound beasts get the job done quite well. Be sure to take a close look at these fiery beauties in the open kitchen as you walk back to the dining room. Once you've ordered, head around the corner to find a huge airy dining room with booths and long wooden tables. 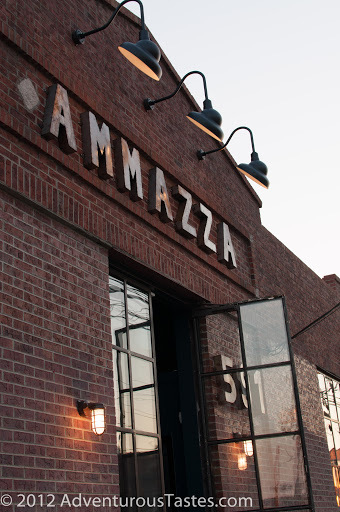 Ammazza's owners ripped out offices that had concealed the high ceilings and beams of this old brick building. 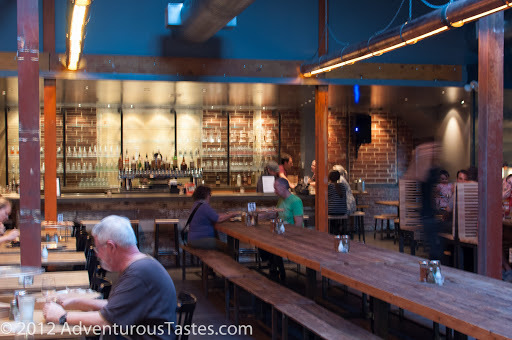 The exposed structure gives the space a cool industrial feel, but the warm woods and exposed brick keep things cozy. The central long tables are on wheels, and rumor has it that late at night they might roll the tables out of the way for more of a party atmosphere. 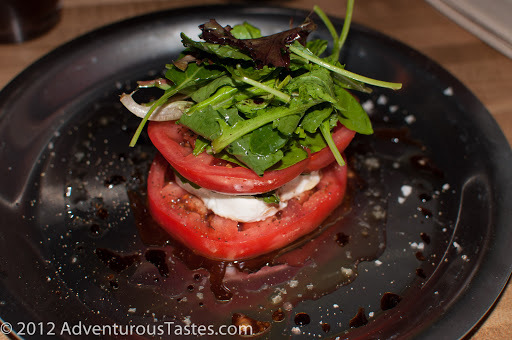 We started with a Pomodoro Caprese. We were somewhat worried about post-summer tomatoes, but were sold on house-made mozzarella. It was a simple preparation, akin to what we make at home all summer, but the tomatoes were surprisingly flavorful and the mozzarella was gooey and salty, just like I like it. 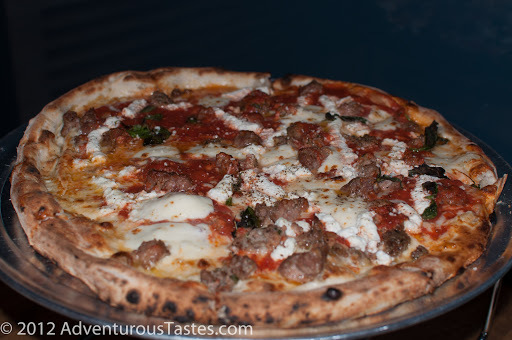 Their pizza know-how was on display with the Bolognese pizza we ordered, which came topped with homemade meatballs and Italian sausage, house mozzarella, ricotta and fresh basil. Pizzas only come in one size, and it was big enough for the Mr. and me to each have 2 pieces and have enough leftovers for lunch for two the following day. The pizza had a nice char and a pleasantly chewy crust. I thought the meatballs in particular were quite delicious. This is a pizza I'd definitely order again. 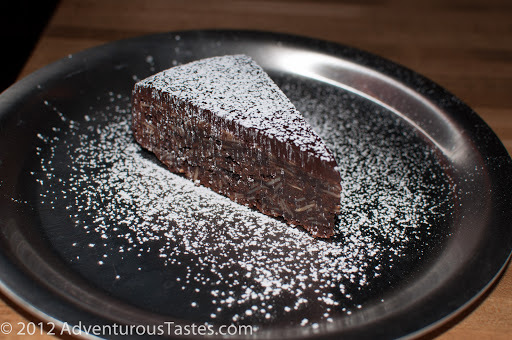 We finished things off with a Torta Caprese, a flourless chocolate almond cake topped with chocolate ganache. It was lighter than most flourless chocolate cakes; and like the caprese we started with, it was both simple and delicious. Atlanta's pizza wars have been going on for several years now, with restaurants like Antico, Double Zero and Varasano's duking it out for best pie in town. It's still early days, but I think Ammazza is a worthy entrant into the fray. In addition to the food, it has a few other points in its favor. The space is cool enough for a date night while the menu is approachable enough for families with kids. Edgewood can be dodgy, but Ammazza has tons of parking in its own lot, so getting there is a cinch. Given it's notably closer to my Va-Hi home and has way more space than Antico--making a seat easier to get-- I suspect it might move to the top of my pizza craving list!